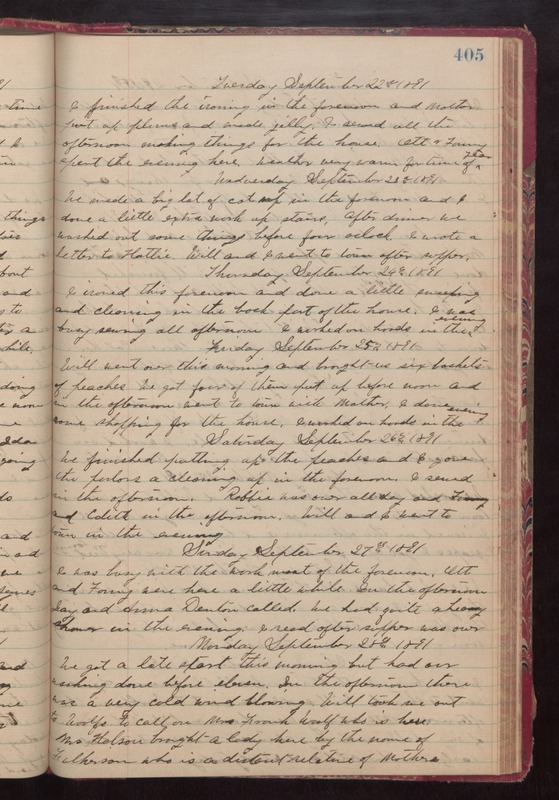 Tuesday September 22nd 1891 I finished the ironing in the forenoon and Mother put up plums and made jelly. I sewed all the afternoon making things for the house. Ott & Fanny spent the evening here. Weather very warm for time of year. Wednesday September 23rd 1891 We made a big lot of catsup in the forenoon and I done a little extra work up stairs. After dinner we washed out some things before four oclock. I wrote a letter to Hattie. Will and I went to town after supper. Thursday September 24th 1891 I ironed this forenoon and done a little sweeping and cleaning in the back part of the house. I was busy sewing all afternoon. I worked on hoods in the evening. Friday September 25th 1891 Will went over this morning and brought us six baskets of peaches. We got four of them put up before noon and in the afternoon went to town with Mother. I done some shopping for the house. I worked on hoods in the evening. Saturday September 26th 1891 We finished putting up the peaches and I gave the parlors a cleaning up in the forenoon. I sewed in the afternoon. Robbie was over all day and Fanny and Edith in the afternoon. Will and I went to town in the evening. Sunday September 27th 1891 I was busy with the work most of the forenoon. Ott and Fanny were here a little while. In the afternoon Jay and Anna Denton called. We had quite a heavy shower in the evening. I read after supper was over. Monday September 28th 1891 We got a late start this morning but had our washing done before eleven. In the afternoon there was a very cold wind blowing. Will took me out to Woolfs to call on Mrs Frank Woolf who is here. Mrs Holson brought a lady here by the name of Fulkerson who is a distant relative of Mothers.